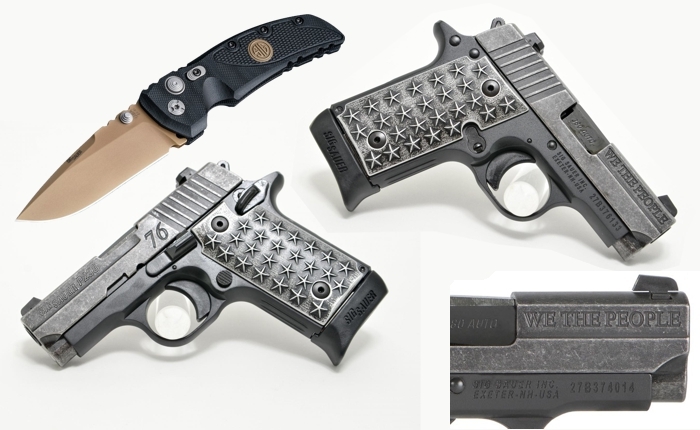 This Sig Sauer Limited Edition P238 ($728) is Inspired by a rich patriotic history. This 1911-influenced .380ACP pistol serves as a fitting tribute to the Second Amendment. This uniquely-American pistol features custom aluminum grips adorned with 50 stars (25 per side) that represent each state in the union. A distressed finish on the stainless-steel slide includes patriotic engravings, such as 13 stars atop the slide and “WE THE PEOPLE” on the slide flats. Reacting to many requests from the marketplace for a subcompact SIG SAUER pistol, engineers designed the P238 as a smart looking, small handgun built with the same accuracy and reliability as large frame SIG SAUER pistols. With an overall length of just 5.5 inches a height of 3.9 inches, and weighing just under a pound, the P238 is the ultimate firepower in an all metal frame concealed pistol. The sear and trigger return spring are redesigned to prevent spring over-ride of the ejector during assembly. This EX-01 3.5" SIG Emperor Scorpion Folder ($249.95) may at first glance look like a piece of jewelry, but do not let its attractive appearance fool you. Inside this knife beats the heart of a beast! The oversized pivot, stop pin and button lock are heat treated stainless steel which provides a robust lock-up. Integrated spacers are designed to ensure the knife’s long-term durability. Finally, a manual safety ensures that the lock cannot disengage, giving fixed blade-like reliability. The EX-01 is an over-engineered tool whose sole purpose is performance. Fast-forward to the 20th century. The SIG P49, the forerunner of the SIG P210, was developed for the Swiss Army and destined to become a legend on the battlefield as well as the competition field. The P220 made its appearance as the new pistol for the army, soon followed by the compact P230 for the Swiss police. These pistols offered new features and levels of reliability never before seen in the industry. By the 1970’s, SIG’s small arms division was expanding to include Hämmerli Target Arms from Lenzburg, Switzerland, and J.P. Sauer & Sohn, GmbH, of Eckernförde, West Germany, known worldwide for their hunting rifles. In the 1980’s, SIG set its sights on the United States of America. The American market was a vital part of SIG’s business plan to continue to expand its market share and become an international leader in the small arms industry. January of 1985 marked the birth date of SIGARMS®, Inc. SIGARMS, then located in Tyson’s Corner, Virginia, imported the P220® and the P230. Two years later, SIGARMS moved to a larger location in Herndon, Virginia, and introduced the P225 in 9mm followed by the P226® and P228 in 9mm. By 1990, SIGARMS was looking to increase market share and begin manufacturing. SIGARMS moved to its present location in Exeter, New Hampshire, and in 1992, began production of the P229® in .40 S&W. Besides importing the SIG Sauer line of pistols, SIGARMS offered customer service from highly qualified gunsmiths in the reputable service department and state-of-the-art training at a separate training facility on 128 acres in Epping, New Hampshire. SIGARMS continued to expand its firearm lines with the Sauer rifle line and the Hämmerli line of target pistols and rifles. In 1998, SIGARMS brought in the first shotgun line designed specifically for SIGARMS by B. Rizzini of Italy. The next year, the revolutionary Blaser R93 rifle line from Isny, Germany, was distributed nationwide through SIGARMS. In 2001, SIGARMS, Inc. continued to expand its role in the firearms market with new contracts in the law enforcement market as well as new products for the civilian market. The SIGARMS Training Academy has added many new courses at its Epping, New Hampshire location for both civilian and law enforcement personnel. Besides a new apparel line and efforts to reach a broader market, SIGARMS will continue its role in educating people in the safety and use of firearms, while offering to the public the highest quality products and services found in the firearms industry. On October 1, 2007 SIGARMS changed its name to SIG SAUER®. The change reflects the vast worldwide growth in demand for SIG SAUER products. In response, the company has more than tripled its work force in the past 30 months, invested 18 million US dollars in state-of-the-art manufacturing facilities and equipment, and significantly expanded its engineering base. The name change, coupled with major new product introductions in pistols and rifles, reflects the continued commitment to the high standards of production, service and innovation the SIG SAUER brand has always represented. Today, SIG SAUER is an ISO 9001 certified company with over 800 employees. It is the largest member of a worldwide business group of firearms manufacturers that includes J.P. Sauer & Sohn and Blaser, Gmbh. in Germany and Swiss Arms AG in Switzerland. This global network of companies gives SIG SAUER a world-class firearms knowledge base, unparalleled design expertise, and extensive manufacturing capacity, enabling the company to respond quickly and effectively to changing market conditions and the needs of its military, law enforcement, and commercial markets worldwide.